Is Drunk Driver Responsible For Killing Drunk Man Lying In Road? Steven Anderson was drunk when he passed out on a rural highway. He was wearing dark clothing and went to sleep on the dark road around 1:00 am. There were no street lights in the area, and he was lying where there is a bend in the road. Darryl Saunders was drunk when he came driving around that bend. When he finally saw Anderson lying in the road, Saunders swerved to avoid him, but it was too late. He ran over Anderson, and Anderson died. Saunders’ blood alcohol concentration was tested at .150. Is Saunders criminally responsible for killing Anderson? No, according to the judge who heard this case in Manitoba, Canada. The prosecutor argued Saunders could have avoided the collision if he were sober, so his intoxication was a significant cause of Anderson’s death. In addition, the prosecutor claimed, police testified it was not uncommon for intoxicated people to pass out on the street, so Saunders should have been on guard for drunks sleeping on the road. The judge disagreed. He said, “On the contrary, one can easily imagine a scenario where just such an accident may occur in these circumstances without any impairment of the driver.” The Judge went on to say, “Ultimately, while I believe Mr Saunders’ impairment…likely or probably was a contributing cause to the accident, I cannot conclude beyond a reasonable doubt that it in fact was a contributing cause, let alone a significant cause.” The judge found Saunders not guilty of causing Anderson’s death but convicted Saunders of drunk driving. A report of the case is on the website for the Winnipeg Sun. During a D.U.I. /O.V.I. trial, jurors are instructed to limit their deliberations to the evidence presented in court. In fact, they are specifically instructed not to investigate or conduct their own experiments. In the recent high-profile trial of John Goodman, a juror ignored that instruction and conducted an experiment regarding the effects of drinking vodka. In February of 2010, John Goodman was driving his Bentley when he rear-ended a Hyundai driven by Scott Wilson. Wilson’s car went into a canal, and Wilson drowned. Goodman, the multi-millionaire founder of the International Polo Club Palm Beach, left the scene without calling 911. He was charged with D.U.I. Manslaughter and Vehicular Homicide. During Goodman’s trial, the judge instructed the jurors not to conduct any experiments or outside research, and to limit their deliberations to evidence presented in the courtroom. One juror, however, conducted an experiment to understand the effects of drinking three vodka and tonics. The next day, the jury concluded deliberations, and Goodman was found guilty of both charges. Vehicular homicide is the topic of a new book by Aspatore Books. The book, Defending DUI Vehicular Homicide Cases, was released in January, 2012 and is part of the “Inside The Minds” book series. “Inside The Minds” is a series of books written by lawyers and executives for lawyers and executives. According to Aspatore, the series ‘was conceived to give a first-hand look into the leading minds of top business executives and lawyers worldwide, presenting an unprecedented collection of views on various industries and professions’. Aspatore is a division of Thompson Reuters. 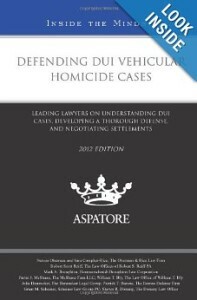 This book, Defending DUI Vehicular Homicide Cases, contains chapters written by nine D.U.I. lawyers from across the country. Topics include case law, client relations, investigation, negotiation, trial preparation, and trial practice. I wrote the last chapter for the book: “Settlement Strategies for D.U.I. Vehicular Homicide Cases”. That chapter outlines my approach to negotiating resolutions with prosecutors and evaluating settlement offers with clients. In Miami, there’s nothing strange or tragic about a police officer riding down the beach on an ATV. What makes this incident strange is the on-duty officer is taking a female passenger on a joyride while he’s on duty. What makes this incident tragic is the officer plows into two pedestrians and severely injures both. According to the Miami Herald, the officer and his partner went, on-duty, to a bachelorette party. After drinking and dancing with the women at the party, the officer gave the bachelorette a ride on his ATV and struck the two pedestrians. One suffered a broken leg, and the other was treated for a broken leg and a damaged spleen. Five hours after the accident, the officer’s blood alcohol concentration was .088. The officer now faces charges of D.U.I. 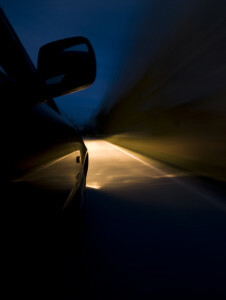 with serious bodily injury and Reckless Driving with serious bodily injury. He posted bond of $30,000 and is scheduled to appear in court on August 24, 2011. In Ohio, the officer would be charged with two counts of Aggravated Vehicular Assault. A person is guilty of Aggravated Vehicular Assault if it is proven that his operation of the vehicle under the influence (or over the legal limit) caused serious physical harm to another person. The penalties include a prison sentence of one year to five years (on each count) and a license suspension of up to ten years (on each count). The Chicago Tribune reported that the driver of a tour bus in Chicago struck and killed a pedestrian, and a blood test following the accident was positive for cocaine. The bus driver is now being held without bail and likely facing charges of D.U.I. and Aggravated Vehicular Homicide. This tragic incident highlights the issues of driving under the influence of drugs, vehicular homicide, and commercial drivers. When we hear a bus driver was charged with D.U.I., most people think of driving under the influence of alcohol. Under Ohio Law, an O.V.I. (same as D.U.I. ), can be committed with drugs in two ways: (1) operate a vehicle under the influence of a drug of abuse; and (2) operate a vehicle with a prohibited concentration of a drug in one’s blood or urine (for cocaine, the prohibited concentration is 150 nanograms). The penalties for O.V.I.-drugs are the same as the penalties for O.V.I.-alcohol. The bus driver will also likely be charged with the Illinois equivalent of Ohio’s Aggravated Vehicular Homicide law. A person is guilty of this offense if the person causes the death of another person by driving recklessly or operating a vehicle under the influence. The penalties for Aggravated Vehicular Homicide include a prison sentence up to eight years and a lifetime driver’s license suspension.